The best part of summer is finally here….it’s peach season! Fuzzy beauties from the first crop of the year were on sale at Klippers Organics recently — you can find them at the Trout Lake Vancouver Farmers Markets every Saturday. As for what to do with your peaches, how about grilled on the barbecue with chunks of halloumi cheese, then drizzled with olive oil, honey and lemon? Farmhouse Natural Cheeses in Agassiz just began offering this semi-hard, brined cheese, and they can also be found every Saturday at Trout Lake. 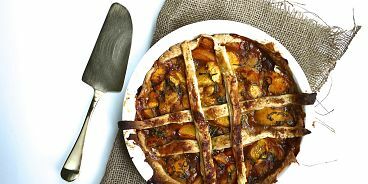 If you’d like details on this dish, head to MyNewRoots.org, a great recipe site that you might want to bookmark. And then there’s always pie to be made. How about spicing it up with some freshly chopped basil or mint? You can find these ingredients at the market too. As a for a recipe, try smittenkitchen’s — her site is smittenkitchen.com — and most every recipe she posts reliable. And lastly, how about a hands on experience picking peaches yourself? There are lots of u-picks in the Okanagan, so get up there, fill your trunk and then stock your freezer for the winter.